Knowing I would be at loose ends in L. A. with our 8 year old on a summer Saturday night, I seized the chance to visit Animal restaurant on Fairfax, white hot popular and still bustling since their opening in 2009. I called ahead to try and get a 6 p.m. slot. Their new system has you leave a message with your request and they phone you back. As we drove to the Natural History Museum by USC, I got the call. Not possible, but come right at 6 and we’d likely get a bar seat. Good enough. We would be “nose-to-tail “eating very soon. Soft shell crab over loosely scrambled eggs, with an intervening layer of pureed salsa. Thin- sliced avocado and radish garnish. We showed up at 5:45 to find a bearded owner/chef outside (not sure whether it was Shook or Dotolo), quietly yelling at some teens along the lines of “my roof and don’t get on it, of course I called the cops.” Some graffitiing kids had broken his gas line. The restaurant would not be opening until it was fixed. The gas company was working on it as we spoke. I took the opportunity to shake his hand and said we were excited to eat there. As dolled-up couples showed up for their reservations, the situation was explained over and over. The hostess brought out some house wine for any takers. Juliet was given a lemonade and some cookies. The hostess also confided she had a cancellation, so a table was ours. Still, the wait dragged on and we arranged to come back. We went to the car and played a tough game of Go Fish. Juliet cleaned my clock using her uncanny ability to get exactly the right cards from my hand just as I was ready to pounce. We returned and were whisked to a table ahead of a few others. Juliet called out a hello to Ashley, the manager who gave her the treats. I suppose we were seen as insiders. Too funny. I toyed with getting the rabbit loin spring roll, and certainly the liver pate on toast, but with a child, unless you are a mean adult, you order one course and that will do it for patience, hunger and tolerance for doing a boring grown up thing. Juliet ordered the flat iron steak with fingerling potatoes and artichokes, finished with a parmesan truffle oil fondue. 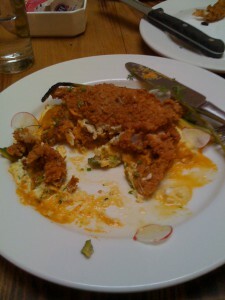 I cannot, and did not, resist soft shell crab, over scrambled eggs, sandwiched with a pureed salsa. I got a glass of a decent French rose and we staved off hunger with a side of garlicky grilled bread, finished with salt. Our waiter eyed the presence of a child warily. C’mon dude. Two tables down featured some glamorous parents out with their 3 year old and a 6 month old in a carrier! Ashley saw to it we got our food quite quickly. Juliet was admired for eating a medium rare steak. She loved it but found the sauce “a little cheesy.” Fair enough. My crab, appropriately, had the liver, so I got a nice burst of mustiness as I ate. That’s what you pay for at Animal, and I got it. 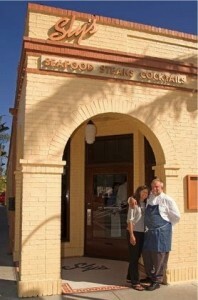 Restaurants usually get complacent after being open a while and endlessly popular. Animal seems in top form, while also maintaining a friendly and unflappable vibe. It’s a neat trick to turn over tables all night while not seeming to rush your customers. Very much a plus is their inclusion of sides with your entree. Too many chefs see every dish as a chance for another sale. Also appreciated by lots of tables the night we were there was the BYOB policy with a $20 corkage fee. Chinese food is everywhere. Indian food is everywhere and who would have thought people would be eating seaweed and raw fish in every major city in America? 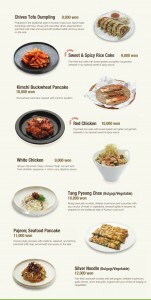 So Korean food may be next. I was in on a so-called “soft opening” last week of a new Bibigo location in Beverly Hills. I had not been to the Westwood one near UCLA, but I have been to many a grocery store in Koreatown for cheap, super fresh produce and seafood. The Koreatown grocery stores have inside dining, usually noodle bowls and dim sum which are hand made on the spot. My expectations were pretty high based on the terrific random food I had had in a low key grocery store. Bibi, I gather, is short for “bibimbop” which means rice and veggies – an absolute staple, the meat and potatoes of Korea. Bean sprouts, chopped leeks, mushrooms, scallions and raw mustard greens are typical. The location is prime, just below Wilshire on Beverly Drive, in “lunch alley”. Beverly Hills teems with workers looking for a new place to eat, so they should get takers. Just how many times can a person eat at CPK? The staff was eager to explain what the food concept was, but not so up on what was in the food. My fantastic shrimp pancake was laced with peppers which I was told were leeks. Then the server checked with the kitchen., Yep. Serrano peppers. There were indeed leeks, plus shrimp and peppers, in a rice flour pancake, crisped brown and with a super hot pepper chili oil and lemony dipping sauce. At least I think it was lemon. The server swore it was not. I was invited to try more and went for the spinach salad with avocado, dried fig and the equivalent of Korean croutons: basically rice krispy treats without sugar. Nutty and good. The salad dressing (no choice) was pureed sesame seeds, wine, a touch of vinegar and more peppers. This could have been put on an old shoe and it would have tasted good. The mix of salad ingredients was a touch off but tasty. I had no room whatsoever but moved on to Bulgogi – marinated beef slow smoked over red oak, then served on a hot stone with hot chilis and mushrooms. As with a lettuce wrap, you eat it by putting it in rolled-up mustard and dandelion greens. I love bitter greens, beef and chilis. Sold. Like all Asian restaurants, dessert is basically defined as the absence of chilis. I tasted a tofu “pana cotta” which was barely sweet and a touch grainy, with a super simple fruit garnish. So dessert is not why you go here. The chain has several locations in Korea and two in Los Angeles. 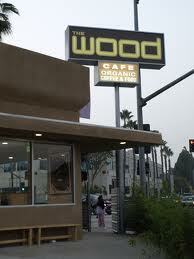 City of Beverly Hills free parking is nearby and the Westwood location offers 2 hours free with validation. They also have a frequent dining club with bonuses, kinda like earning a free cup of coffee at Coffee Bean. And to help your dining experience? Be a chilihead like me. I met an old friend for dinner at The Wood, one of the many casual dining spots in Culver City, a subsection of west L.A. that has its own mayor, city council, and white hot food scene that gives Silver Lake a run for its money. The venerable cook and gourmet food supply shop Surfas anchors the area, plus there are a couple of small storefront cooking schools. Locally, food is on the brain. And indeed the co-owners ran a coffee shop and a cafe, respectively, and met at a farmer’s market. That would be Demetrios Mavromichalis of Venice Grind and Laurent Triqueneaux of Cafe Laurent. It doesn’t hurt that there are film studios and media companies nearby to keep the caterers and lunch spots busy. Lest you picture quaint streets and adorable areas to walk, I’ll set you straight. Culver City was a suburb developed in the late 40’s/ early ’50’s at the height of L.A.’s love affair with the car, and has wide, bleak streets and pretty ugly architecture. Style-less Moderne, let’s call it. Travel a block and you will doubtless see an auto repair shop. Not exactly Rodeo Drive. A bleak corner with good food. There is mostly outdoor dining at meat-and-potato-centered The Wood, but we ate inside as it was 55 degrees, people! The cafe promises locally-sourced ingredients whenever possible, which is quite easy in California. My rose wine was from Santa Barbara, for example, as was my side dish of kale, but my perfectly medium rare lamb chops were from New Zealand. The amount of garlic in the chimichurri sauce on top of them could only be described as fearless, and very possibly from Gilroy, a garlic-growing center in mid state. The lamb stood up to the garlic. I did, too. My friend’s pork chop was a shade dry, but the accompanying mashed potatoes were way better than mom-style. We started with fritto misto, since the fried brussel sprouts appetizer would overdo me with a double load of winter vegetables. The tempura-battered veggies and a few shrimp were good enough, but oily, indicating less than fresh or double-used oil, as a general rule. Just a guess. It was served cutely in a cake baking tin lined with parchment paper. I’d go again and try a burger, and the sprouts, and try to find room for the chocolate pot de creme, too. The desire to go again means this is a good place, and, as my friend noted, way better than the tired greasy spoon that used to be there. Driving back to the freeway you’ll pass an only-in-L.A. series of storefronts, namely a famous sword and gun collectors shop, a relatively new mosque, the headquarters of nfl.com, a Lutheran church, the DMV and Sony Studios.